We’ve been chatting to Playwright Ella Hickson about her experience as Dramaturg Adviser on Plan B for Utopia. 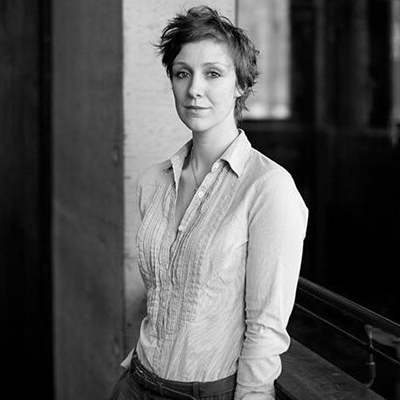 Ella Hickson is an award-winning writer whose work has been performed throughout the UK and abroad. She is currently writing new plays for the Almeida, The National Theatre, and the RSC. Her first play, Eight, won a Fringe First and transferred to New York and the West End. Ella was the Pearson Writer in Residence at the Lyric Theatre Hammersmith and she is the recipient of the 2013 Catherine Johnson Award. Ella will be joining us for a post show discussion at Battersea Arts Center on 1 June 2016. What’s your experience in working with dance and what interests you about it? I’ve always enjoyed watching dance. There is something in the abstraction of it that really appeals to me. Dance has often been as a part of my dramatic work but rarely a point of focus. I then worked with Ben Duke as part of a dance/writing collaboration which is where I met Joan Clevillé. A lot of my work, because I work with language, is about trying to pin down meaning, to communicate things in a very rational and specific way. Dance, because it is based in movement, is much more open in its communication of meaning. It operates in an abstract and emotional register – an audience has to absorb, receive and experience – rather than listen, understand and conclude. Working with dance, therefore, forces me to into a new and challenging relationship with meaning : should it be prescribed? How does story work in an abstract context? What happens to ideas of character? If story isn’t the determining force behind structure then what should dictate form? Describe your involvement as a dramaturg advisor for Plan B for Utopia? I worked with Plan B for Utopia in two ways. The first was through conversation with Joan about the ideas in the piece at the planning stage. I would look at documents around ideas and story that Joan sent me and I would offer my thoughts on the clarity of the ideas, structure and character. I then worked with the company in the room. I visited their workshop in Edinburgh and watched as the piece developed physically – again i was keeping an eye on structure and story whilst always aware that the abstraction of the piece is what gave it its magic. What’s special about working with Joan and dancers? Working with Joan and the company has always been hugely rewarding. I think what is unique is that we both have a real respect for one another’s disciplines. I love dance and think the work that Joan creates is astounding and yet I don’t know very much about dance, I’m in no way an expert and look at the work with the awe and wonder of a novice. Equally Joan seems to have a real interest in the dramaturgical perspective that I bring to the table and again he approaches it with the interest of someone that hasn’t often encountered it. I have also rarely worked with people that are as committed in their work ethic – I very much feel, when I am with them, that I am in the presence of exceptional talent and I find the professional rigour of the process compelling. They are also wonderful, kind and generous people and its a joy to be in the room with them. What can a dance theatre work like Plan B for Utopia add to the wider conversation about social and political change? I think looking at socio-political issues through the medium of dance offers an opportunity for audiences to engage emotionally with issues that are usually the domain of newspapers and debate. Whilst social and political issues can be argued intellectually, if we agree that change requires action, I believe that action is more effectively inspired by emotion than argument. Plan B for Utopia is an example of a piece of work that encourages emotional engagement. What’s next for you? Could you tell us what are you working on at the moment? This year that I have a show opening at The Almeida in the autumn and I am completing two other scripts – one for The RSC and one for The National Theatre. I am also looking forward to working with Joan and the company on their new project in the summer.